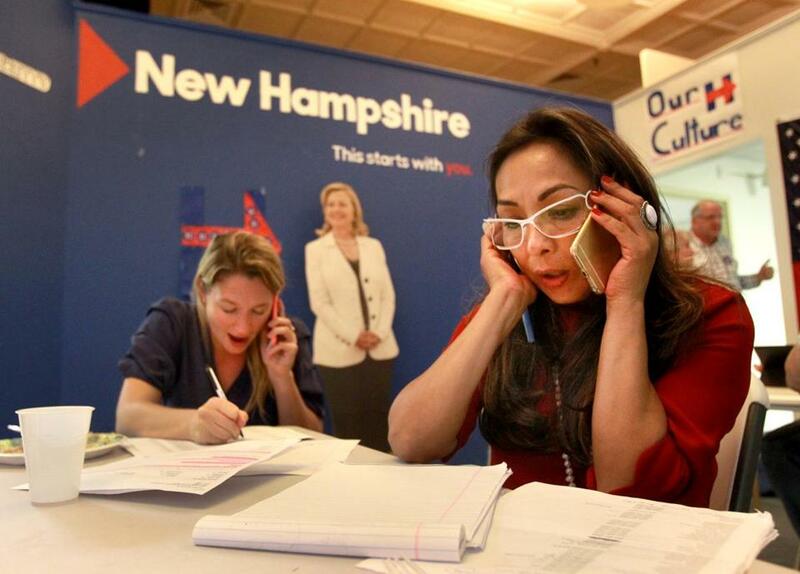 Letizia Ortiz (front) and Katie Gladstone handled phones at Hillary Clinton’s headquarters in Manchester, N.H.
LACONIA, N.H. — The sauna-hot room was silent as a woman told a halting and tearful story about her son’s struggle with a serious mental disorder. Some in the audience of 300 packed into a Boys & Girls Club in this lakeside town appeared moved by the story. But not, at least that one could tell, the woman who organized the forum, which was intended to focus on the scourge of drug addiction in New Hampshire. Hillary Clinton physically backed up closer to a wall as she listened and nodded. When the woman finished her story, the leading Democratic presidential contender retrieved a microphone, turned away, and began asking another panelist to respond. The descent of the GOP into dishonesty, lies, and cravenness is no joke. It’s a national crisis. 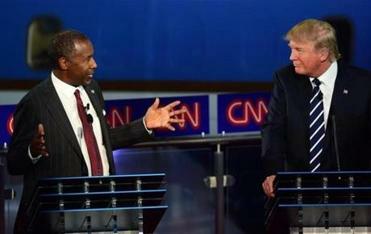 Read: Republican endorsement tracker in N.H.
No real show of compassion. No hug or even a touch on the hand. It was one of the starker examples of Clinton’s failure to connect with voters during her current campaign swing and others before it. The problem is one that has haunted her before and is leaving Democrats open to other options like Vermont Senator Bernie Sanders or pining for Vice President Joe Biden, a political leader almost as gifted at responding with emotion when a public occasion calls for it, as Clinton’s own husband. The dark pine forests, clear lakes, and craggy coastline of this first-in-the-nation-primary state are traditionally Clinton territory. It is the place where her husband’s campaign was saved with a second-place finish in 1992. It is where voters rallied behind her in 2008, reviving her White House bid after a loss in Iowa. But the last six public polls have shown that she is down anywhere from 4 to 22 percentage points to Sanders. That is despite a clear advantage on the airwaves: For the past seven weeks, Clinton has been the only Democrat beaming glossy television ads into New Hampshire homes. And Republicans aren’t yet airing ads attacking her. The reasons for Clinton’s stumbles in the Granite State echo her troubles nationally, according to two dozen interviews with Democrats here. There are the persistent questions among voters about why she set up a private e-mail server as secretary of state. There is her robotic delivery and heavy reliance on generalities during her stump speeches. There is the gravitational pull of Sanders’s unlikely, insurgent candidacy. What is odd is that longtime Clinton allies and even new supporters repeatedly talk about Clinton’s personal warmth when they describe their devotion to her. They are mystified why this side of her rarely comes out on the campaign trail and they urge friends to see her in person in a small setting. This worked for Michael MacLeod, a Clinton volunteer who approached her at a town hall meeting and said he was dying of lymphoma. She took a few minutes to listen and it meant a lot to him. “None of the other candidates would give me their time,” he said. The two did have a face-to-face exchange, and Wood was delighted. “It’s almost like you wish everybody could meet Hillary in person,” she said. But they can’t. The Clinton campaign is expecting more than 200,000 voters to participate in the New Hampshire primary. Tens of millions more will vote in other primary states and the general election. To help foster more of these intimate exchanges the Clinton campaign is focused on getting as many voters as possible in front of Clinton at town-hall-style meetings. They leave time at the end for Clinton to work the rope line and create some of those critical personal exchanges. Then there is a relentless follow up; those who attend Clinton events will get at least two phone calls from supporters. Leading this effort in New Hampshire is Mike Vlacich. He managed New Hampshire Senator Jeanne Shaheen’s successful reelection campaign here last year against Republican Scott Brown, making him the only Democratic campaign manager in the country to come up with a win in a tight Senate race during the 2014 GOP wave. Over a pizza in downtown Manchester last week, Vlacich projected calm. He is not worried about the poll numbers, which he said are likely to swing. But putting Clinton in small settings is critical, he said. “You have to work to be sure your candidate can connect directly with voters,” he said. He noted that the state has a history of flirting with underdog candidates only to dump them on Election Day. Vermont Governor Howard Dean attracted enthusiasm in New Hampshire but ultimately lost the state and the nomination to John F. Kerry in 2004. A similar dynamic occurred in 2000 when insurgent Bill Bradley drew big New Hampshire crowds but lost to sitting Vice President Al Gore. The lesson is that raw enthusiasm, like the kind that Sanders’s operation is generating, can be very difficult to turn into actual votes. Sanders’s campaign acknowledges that corralling its volunteers into a modern, professional campaign will be difficult. “I always say that the campaign started running a marathon without putting on shoes,” said Sanders’s New Hampshire manager Julia Barnes. What the Clinton operation lacks in the candidate’s aura on the stump, they are trying to make up for with sheer esprit de corp and a highly efficient machine. One recent night about 30 Clinton volunteers — people who will be critical to getting out the vote for February’s primary — came to Clinton’s high-ceilinged Manchester headquarters to staff the phone bank. The evening started with a slide show featuring photos of many of the people there standing with various Clinton campaign staffers, and in some cases with Clinton herself. Then volunteers talked about the personal bonds they’d forged with other volunteers while participating on the campaign. Over ginger pasta and lemon cupcakes, they swapped stories about fending off dogs while door knocking. It felt a bit like Camp Clinton. The night’s mission was to call Democrats and persuade them to attend a town hall the next night in Concord. The next day at the Concord town hall there were about three dozen empty seats in the back, a phenomenon rarely seen at Sanders’s events. Among the attendees, though, was Sally Kelly, a woman who said she went to the event only after receiving a call the previous evening from the phone bank. “When they called last night, I said I was still not sure about Hillary,” she said as she was walking out with a friend. She liked the aspects of Clinton that turn off others: her moderation, her poise, her command of details. By the end of the night, Kelly was a convert. “I’m ready to go work for her,” she said.